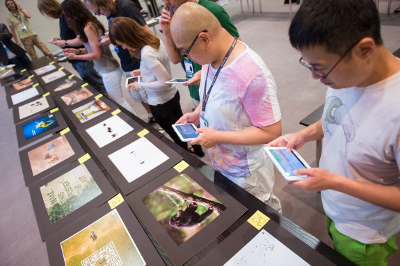 At last year’s Cannes Lions International Festival of Creativity, WWF served as the charity beneficiary for the Young Lions Print competition – a forum for the advertising industry’s next generation of talent to harness their creativity. We had 80 of the brightest young minds in advertising working on our brief – to help grow our core base of supporters on social media. They had just 24 hours to make it happen. Our brief focused on social media. For non-profit organisations like ours, there is tremendous power in each new connection we make — and over the last decade, these connections have been increasingly made through social media. Each additional supporter gained ultimately helps amplify our ability to engage the public, governments and the private sector toward positive change. We asked the Young Lions teams to create an Out-of-home advert to grow our fan base on social media. The concepts were based on the idea that you don’t have to go to extraordinary lengths to help endangered species: your journey can begin simply by engaging with WWF. Of course, once someone begins following WWF, they can be engaged on a regular basis and empowered to take deeper and more significant actions to support our work. We also felt leveraging a print medium to drive a social action would make the challenge more interesting, especially as increasing numbers of people access social media via their mobile devices. As a charity participant, once you arrive in Cannes, the competition begins with a briefing at the Palais. It’s your opportunity to meet the 80 or so Young Lions who will be working for you over the next 24 hours. One of the best parts of the experience is that none of the competitors know the identity of the charity until you step in front of them, so the “reveal” is an exciting moment. When WWF’s iconic black and white panda logo appeared on screen, there was an audible cheer from the crowd, and for me it was a really great moment to see strangers from all corners of the globe simultaneously identify with our brand. The next morning the competition starts officially. Competitors are divided up into teams of two: an art director and a copywriter, each representing their home country. They come from some of the industry’s largest agencies as well as smaller boutique firms. I enjoyed walking the floor, in awe of the sheer multitude of countries represented in the competition. As the charity representative you’re on hand throughout the day to answer questions, provide inspiration and get to know the competitors. The atmosphere is jovial, but intensifies as the day wears on. By mid-afternoon, the first print outs start rolling off and the teams work to make final adjustments before their work is submitted. My favorite part the entire experience was seeing the depth and breadth of creative executions. Each interpreted the brief in subtly different ways. Concepts ranged from safe, to completely out of left field, to just plain impressive. Heading into the competition, I wasn’t sure what kinds of work we’d get out of the competition, but of the 40 submissions, we could have run with half of them as print ads or social media content right out of the box. And about five of the 40 were the kinds of brilliant ideas people pay big dollars to top agencies to develop. The next day, you join the Cannes Print Jury who judges the entries. All 40 presentation boards are laid out and the Print Jury discuss their thoughts on each concept and how well it responds to the brief. Votes are tallied, and Gold, Silver and Bronze are ultimately assigned after some discussion on the merits of the winning concepts. All of the three winning concepts, took our creative brief and ran with it in new and imaginative ways. The Gold-winning team (Chihiro Yabe & Yuri Uenishi from Dentsu Japan) were particularly imaginative. They used a traditional social media influence map, (usually a word or picture cloud of individuals inter-connected by lines to show relationships) and morphed the cloud into the shape of a polar bear. The end result was about as elegant a solution as you could find, showing how individual WWF social media followers are connected to something bigger than themselves. I could easily see this concept applied to any number of species the WWF protects, and ways in which this one simple idea could be applied to a multitude of creative mediums. Following the festival, I was given all of the creative source files for each concept developed and took them back to WWF to share with colleagues. The concepts were very well received by our leadership team and have sparked several interesting conversations around consumer engagement. The most important thing I’ve come to understand since leaving Cannes is that the value of the work done by these talented future creative leaders goes far beyond the medium of your selected competition, and brings with it the potential to spark new thinking about your brand, deliver fresh insight into how it’s interpreted around the world and generate creative inspiration within your own organisation. Collin leads efforts to engage private sector companies in WWF’s conservation efforts. In this capacity, he leads the organisation’s relationships with Starbucks and Bank of America, among others. He is based in Washington, DC.